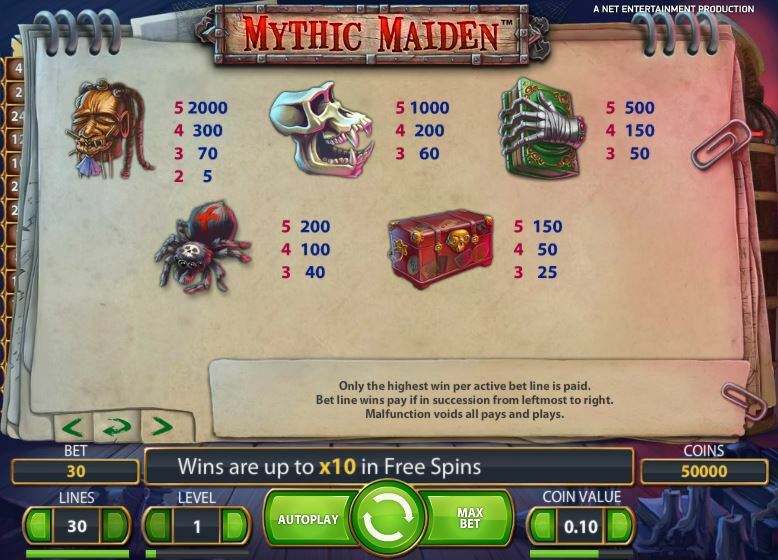 Offered by Net Entertainment, Mythic Maiden is a bit of a scary looking slot machine, which borrows its name from a Medieval torture device, called an Iron Maiden. Looking like a cabinet which was made out of iron, it had spikes inside and people that were tortured were locked inside of it. You can actually see the dreaded torture device on the right side of the reels. The rest of the design looks fit for a Halloween slot machine, with skulls, deadly spiders and mummies appearing among the symbols. 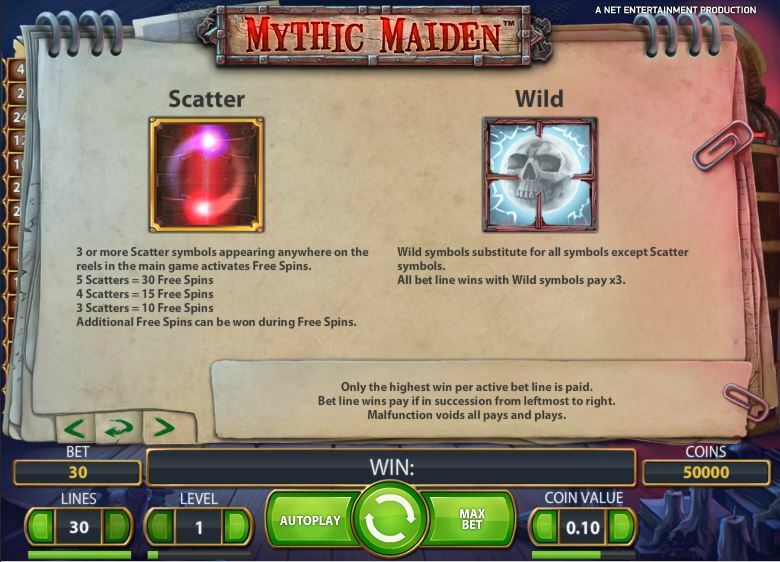 You will get 5 reels in Mythic Maiden, same as in most slots released these days, while the total number of active lines goes as high as 30. You are offered free spins, big multipliers, wild symbols and scatters along the way, plus a top prize of $10,000. 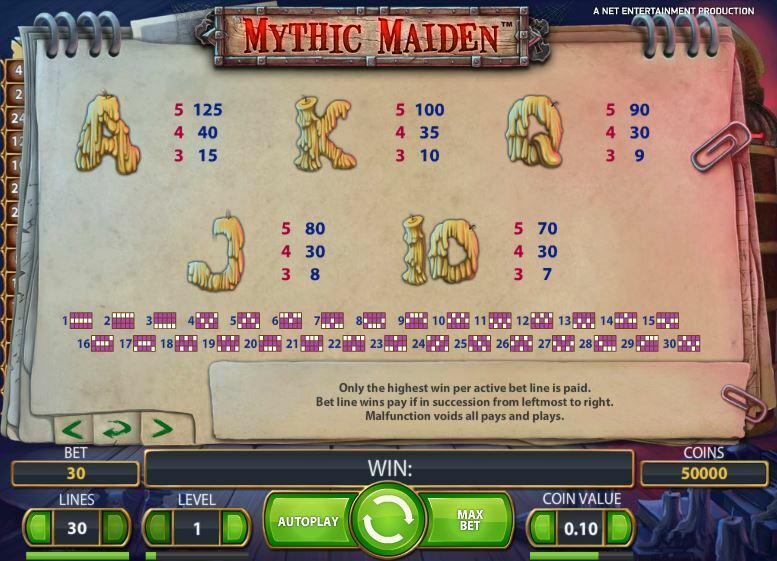 You will find that all the features that you could want from a normal slot machine are available in Mythic Maiden. That means access to a wild which multiplies wins, to a scatter symbol and to free spins. The wild is the one that shows you a full moon through a window, as it transforms into the image of a skull. The wilds are the ones that you use to form combinations that you wouldn’t normally have the symbols for. If the wild lands on such a line, where there aren’t enough matching regular icons, it will take the same role as them and you get a new win. You also get a payout worth three times more than usual, the wild bringing with it a 3x multiplier. 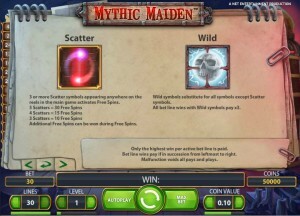 As for the scatter, it is responsible for the start of the round with free spins. You get 10 to 20 spins, depending on how many scattered Energy symbols are on the reels in the same round (3 to 5 needed). You can retrigger the free spins while you use the initial rounds won. 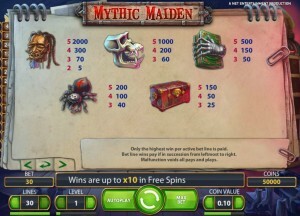 The Iron Maiden device which is on the right side of the reels will open up while the free spins are running. 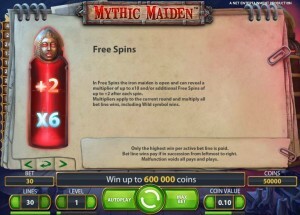 It will show you extra free spins and/or bigger multipliers. 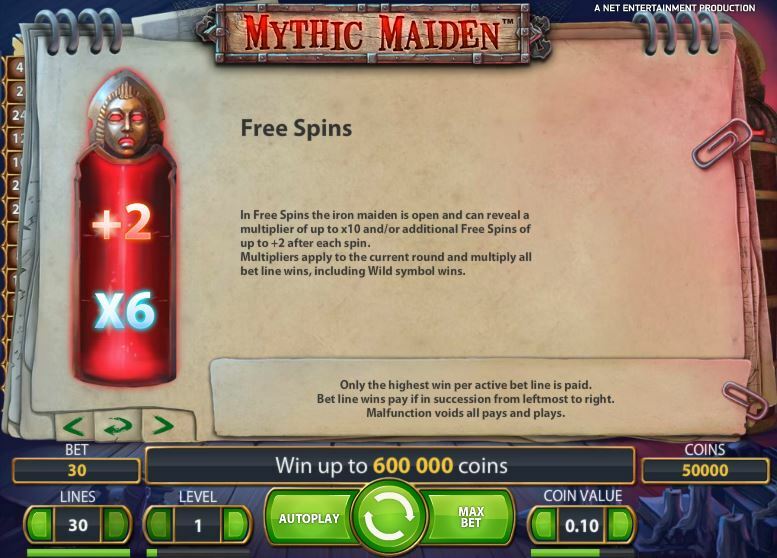 You can get 2 free spins, or multipliers of up to 10x. Only the current round benefits from that random multiplier. 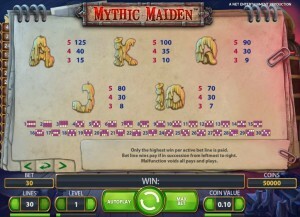 There are three components in a bet placed in Mythic Maiden. You have the Lines section first, where you choose between 1 and 30 to be active. You have the Level of the wager next, which basically allows you to choose 1 to 10 coins to be used for each line. Finally, there is the Coin Value, which starts at $0.01 and reaches $0.50. You can wager up to $5 for one line, with $150 being the total bet. 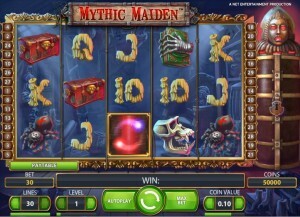 As for the slot’s top payouts, the 2,000x multiple offered by the Mummified Head symbol will put $10,000 in your pocket, provided that you used the right wager. The action in Mythic Maiden looks like it takes place in a dusty attic, where someone discovered this incredibly dangerous torture device. It’s not the only thing found inside though, as you also have spell books with severed hands holding them, mummified heads, treasure chests with skull decorations and playing cards which are made out of melted candles. All in all, a scary looking title which would be a pleasure to try out when Halloween comes. Symbols: Full Moon (wild), Life Energy (scatter), Mummified Head (2,000x), Skull (1,000x), Book (500x), Spider (200x), Red Chest (150x), Ace (125x), King (100x), Queen (90x), Jack (80x) and 10 (70x). The game has plenty of things to offer you, including a theme that you will not get anywhere else, some cool features and a design like only Net Ent could create. I recommend you try it out. 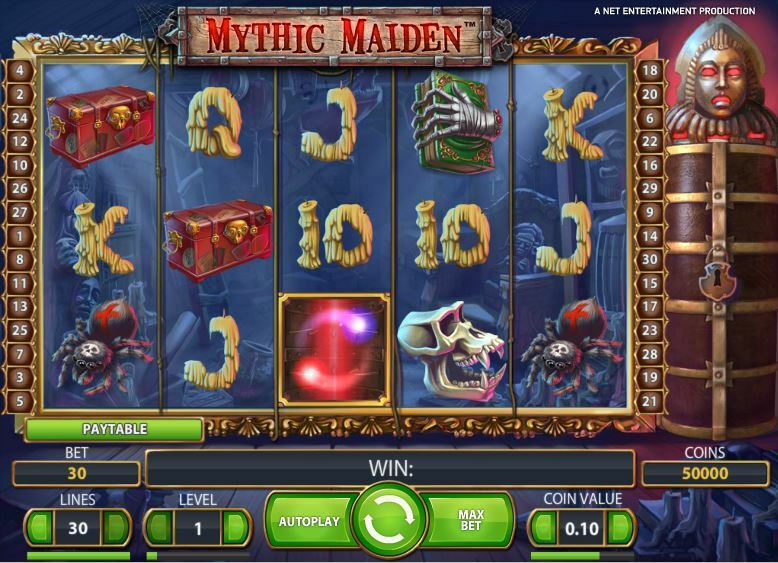 The Mythic Maiden slot machine is offered through the NetEnt platform, so if you want to play it for real or just to practice, look out for casinos that use it.